This fantastic gift set is perfect for the Dr. Who fan in your life! It includes five different ornaments. 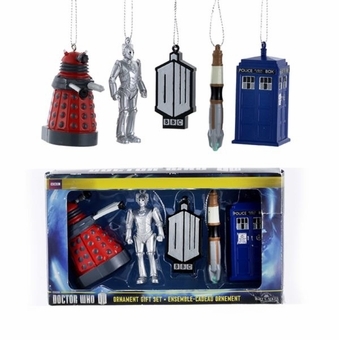 One features a red Dalek, and another is a a shining Cyberman. The third is the Doctor Who logo, and the fourth is a Sonic Screwdriver. Lastly is an iconic blue Tardis! It's a delightful gift idea, and the decorations would look great on a Christmas tree... or anywhere else, for that matter!